That's the kind of Philadelphia story most of you probably thought you'd never read. Phillies general manager Ruben Amaro Jr. said early Tuesday morning that he could neither confirm nor deny the deal, but rumblings about the Phillies' involvement in the Lee bidding started early Monday night, and just before midnight, MLB.com reported that the Rangers had been told that the veteran lefthander was signing with the Phillies. Lee will receive a deal reportedly worth $120 million over five years with a sixth-year vesting option. His agent, Darek Braunecker, did not return phone calls from The Inquirer. The 32-year-old lefthander went a combined 12-9 with a 3.18 ERA with Seattle and Texas last season and has a career record of 102-61 with a 3.85 ERA. In 10 career postseason starts, he is 7-2 with a 2.13 ERA, including a 4-0 record with the Phillies during the 2009 postseason. "It's a big deal for us," Phillies manager Charlie Manuel said Tuesday morning during a team event at the Coatesville VA Medical Center Community Living Center. "At the same time, it's not official yet, so to me it's like a rumor until we're ready to go." Both the Yankees and Rangers had better offers on the table, but Lee apparently fell in love with the Phillies during the team's 2009 run to the World Series and wanted to return. The Yankees, according to ESPN, offered a six-year deal worth $138 million with an option for a seventh season. 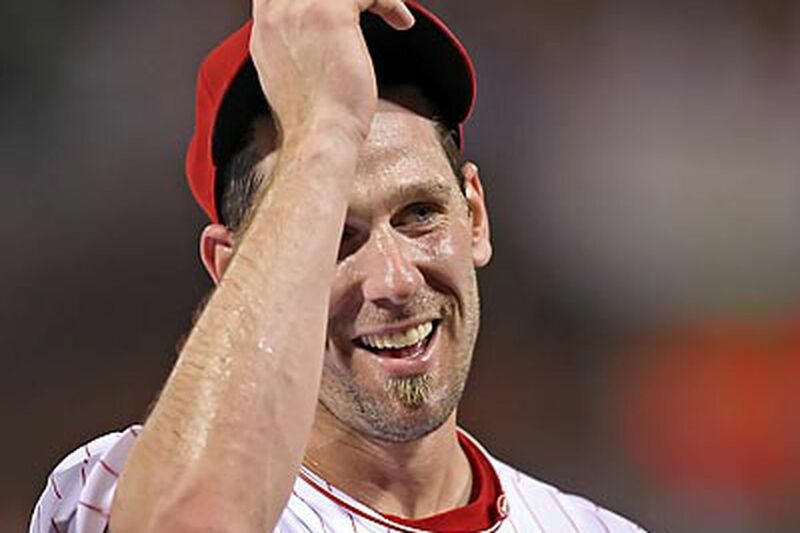 After the Phillies traded him to the Seattle Mariners last year, there were times when Lee sounded like a jilted lover when he talked about the Phils. Lee's deal with the Phillies comes exactly 362 days after Amaro traded the lefthander to the Mariners for three prospects on the same day that the team acquired Roy Halladay from the Toronto Blue Jays for three other prospects. The main lament from Phillies fans at the time was that the team did not keep both aces. Amaro said at the time that the Phillies needed to restock its farm system. The general manager was widely criticized for much of last season because the three prospects the Phillies received for Lee - pitchers Phillippe Aumont and J.C. Ramirez and outfielder Tyson Gillies - all had disappointing seasons in the minor leagues. Amaro atoned for the loss of Lee at the trade deadline when he managed to pry Roy Oswalt away from the Houston Astros and the Phillies went 49-19 in their final 68 games to win their fourth straight National League East title. The team's bid for a fourth straight NL pennant fell short when they lost to the eventual World Series champion San Francisco Giants, the one team that may have had a deeper starting rotation than the Phillies. The Phillies will go into next season with the formidable quartet of Halladay, Lee, Oswalt and Cole Hamels, which will unquestionably make them the favorites not just to win the National League but also the World Series. When the Phillies traded Lee last December, the feeling was that they could not afford to keep both him and Halladay on the payroll. Asked several times about the payroll in recent weeks, Amaro and team president David Montgomery refused to say what the ceiling for 2011 would be. Amaro said before the end of the winter meetings last week that the Phillies would be willing to spend for the right free agent, but added that he did not expect the team to make a big move. That statement was similar to one he made last December just before the Halladay and Lee trades. The Phillies will lose their first-round draft pick for signing Lee and their payroll is currently more than $170 million for 19 players, an unthinkable amount two years ago and perhaps even two days ago. There are reports that the team is trying to get rid of some salary by offering Joe Blanton, Raul Ibanez and Kyle Kendrick in trades. But even if they can make those deals, the Phillies' payroll will remain in uncharted territory. The story for this day is that Clifton Phifer Lee loved Philadelphia so much he decided there was no other place, including Yankee Stadium, where he wanted to play.